When you order a pair of hand built wheels from us, you receive a custom product made to the highest standards with a comprehensive warranty (see ‘Our Guarantee’ at the bottom of this page). DCR Wheels offers an extensive range of wheels to provide value for money, excellent performance and first class aftermarket care. They are serviceable, rather than disposable items. If you want to find out more about the ordering process, please visit The Ordering Process/FAQs. If you are unsure what you are looking for, you could start with Wheelset suggestions. We provide lots of information on this site are designed to help you make an informed decision. If you are finding that overwhelming or would simply prefer more personalised advice, feel free to get in touch. If, on the other hand, you are looking for even more information you can find it in ‘Professional Wheelbuilding: The Manual’, available to purchase here. Hand built wheels are custom made for you. They are built to suit your specific riding conditions, along with factors such as rider weight, climate and aesthetics. Hand built wheels can retain compatibility with older components. They can also maximise the worth of existing components; if a rim is worn but a hub is still in good condition, the hub can be built up into a new set of wheels giving it new life. A well built wheel will be stronger, perform better and last longer: no two wheel components are exactly the same, the components contain discrepancies. Each build needs to be different. A uniform build cannot provide the unique balance of tension required. Building by hand also allows for each component to be handled and assessed individually, adding another level to quality control. A wide variety of advanced lubricants and preparations are used to ensure each wheel performs as well as it can for as long as it can. Every wheel is pre-stressed intensively using a five stage stressing process. If tensions drop, the wheel is re-tensioned and the stressing process is undertaken again, each wheel is also given a rest period for components to settle before final stressing/checking. Each wheel will be delivered fully tensioned to within manufacturer’s specifications. Tensions are checked using P&K Lie tension meters, calibrated by Sapim. These have been individually calibrated for the complete Sapim spoke range. The meter has a reference stick and its state of calibration is checked regularly. 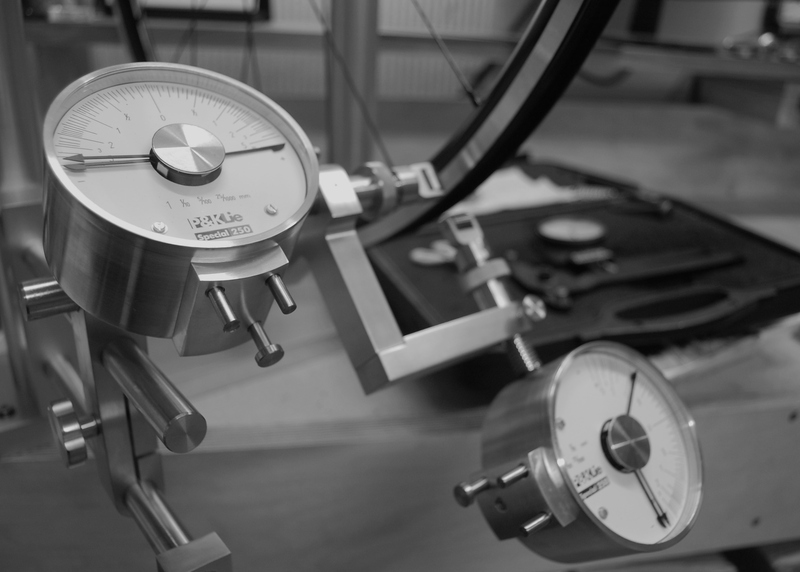 Additional meters (one Wheel Fanatyk and DT Swiss) are also kept to allow for servicing/calibration. The DT meter is calibrated for DT and Sapim spokes. There is no more accurate way to measure spoke tensions on Sapim spokes. Spoke tensions will be as even as possible but there must always be a compromise between trueness, roundness and evenness of tensions. Our P & K Lie Special 250 stands are used for all builds, allowing for dishing, trueness and roundness to be measured to within 25/1000 of 1mm. Not all components allow for such high tolerances, however with every wheel the optimal balance of tensions, trueness and roundness is reached. We have a range of tools available for you to purchase from DCR Wheels. 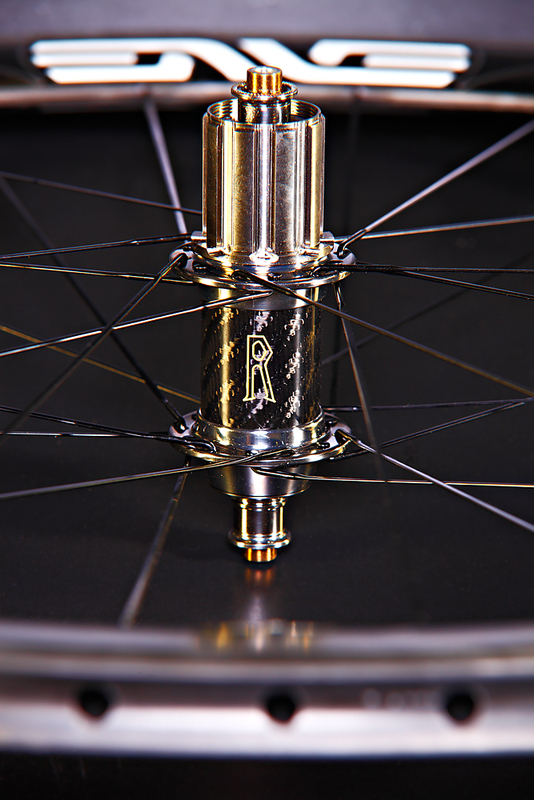 DCR Wheels offers a lifetime warranty for spoke replacement and retrues. Wheels are produced to within 0.1mm of lateral trueness unless otherwise stated. That is equivalent to the average size of a grain of sand or the thickness of a human hair. If you you want peace of mind for any reason; you can send your DCR wheels back to our workshop to be checked free of charge. This warranty does not cover shipping costs or improper use. In the instance of hub or rim failure this will be covered by the manufacturer’s guarantee policy.